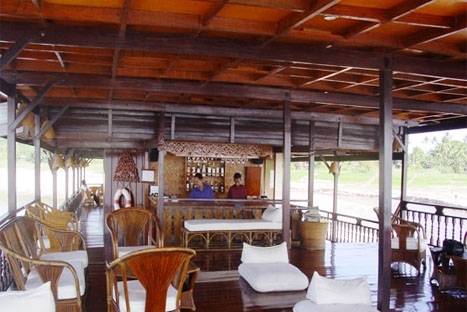 The Vat Phou Mekong cruise proposes a 3 day / 2 night cruise that starts and finishes in Pakse, Laos. This cruise on the southern part of the Mekong river in Laos visits the majestic UNESCO World Heritage Vat Phou ruins at Champassak, the mysterious Oum Muong ruins at Huei Thamo, the 4,000 Islands with its myriad of waterways, and the Pha Pheng waterfall on the Laos - Cambodia border. Cruise the “Mother of Waters” to the wild paradise of the “4,000 islands” on the Vat Phou, your comfortable floating air-conditioned teak hotel, with twelve cabins, each with twin beds and private hot and cold shower. Shaded upper deck for lounging, restaurant on board serving the finest Laotian, Vietnamese and Thai cuisine, beer, wines and spirits are also available on board. After meeting at the Sinouk Coffee House in central Pakse at 09:30 am. you will board a bus to travel Route 13 to the historically significant Khone Pha Pheng waterfalls, the “Niagara of the East”. You will then be driven to the fishing village of Ban Xieng Di for lunch at local restaurant. After lunch, you board small boat for a visit to Don Khone Island to see the old French railway and walk on the bridge that links Don Khone and Don Det Islands. The boat drops you at the Don Khong Island village of Ban Dong Veuthong, where you will board the waiting Vat Phou boat for a sunset cruise and dinner, docking riverside for the night. Breakfast is on board the Vat Phou boat as we set sail to Ban Dua Tae. You will walk through this small Lao Loum Village, seeing by centuries old traditions still being used. The Vat Phou boat then continues to cruise north, past the island of Don Xai, and many other small islets in the river archipelago. Late afternoon, you visit the village of Ban Huei Thamo and the mysterious Oum Muong forest temple, just a few minutes walk way. 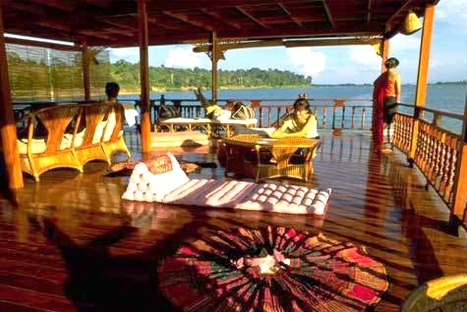 Dinner aboard Vat Phou then you have the rest of the evening to relax and enjoy the silence. While enjoying breakfast on board, the Vat Phou continues its cruise to Champassak. The highlight this morning is the Vat Phou ruins - the majestic pre - Angkorian 10th century temple complex and boat’s namesake. You have time to visit the museum at the ruins site, walk up to the highest temple and take as many photos as you would like. We return you to the boat for your final lunch on board. A small boat will then take you back to Pakse, arriving around 16:00 pm. After meeting at the Sinouk Coffee House in central Pakse at 09:30 am. we transfer you to a longtail riverboat for your 2.5 hour journey to Champassak. Upon arrival and check in on board Vat Phou boat, lunch is served on the deck. The highlight is the Vat Phou ruins - the majestic pre - Angkorian 10th century temple complex and boat’s namesake. Visiting the museum at the ruins site, walk up to the highest temple and experience the best panoramic viewpoint. As dusk falls, we transfer you back to the Vat Phou boat before sunset observed from the deck. Dinner is served on board, while the boat docks for the night alongside a remote Laotian village. Breakfast is on board as we set sail for the village of Ban Huei Thamo. This is a small village a few minutes walk away from the mysterious hidden forest temple of Oum Muong. Afterwards we rejoin the boat to continue our cruise southwards. Lunch is on the deck, while leisurely sailing closer to the wild paradise of the “4,000 Islands”. Late afternoon we disembark from the boat to walk through Ban Dua Tae, a small Lao Loum Village where the traditional way of life has not changed in centuries. Our day’s cruise finishes at the most northern tip of Don Khong Island, the largest inhabited island in the river archipelago. After dinner, the evening is yours to relax and enjoy. While you breakfast on the deck, the Vat Phou boat cruises to the small village of Ban Dong Veuthong where you board a small boat to meander among the 4,000 Islands to Don Khone Island. You will visit the old French railway and walk across the bridge that links Don Khone and Don Det Islands. We continue on the boat back to the mainland for lunch at a local restaurant in a small fishing village, Ban Xieng Di, on the banks of the Mekong. A bus transfers you to the historically significant Khone Pha Pheng waterfall, “the Niagara of the East“, close to the Cambodian border. We bring you back to Pakse for the end of cruise experience, arriving around 16:00 pm.